Once you’ve realized your husband has been unfaithful to you, it’s difficult to think about putting the pieces of your marriage back together again. You feel absolutely shattered, and you’re not really sure what you should do. Maybe you’d like to try to make it work, but it all seems so hopeless. This is where many couples give up, and one or both of them make some major mistakes that lead to the end of the marriage. Let’s talk about five of those mistakes in more detail. One of the things many wives do after they’ve discovered that their husbands have been unfaithful is attempt to jump right into making everything feel as normal as possible. In doing so, they’re rushing through the healing process, and there is a reason why healing is a process and not something that can occur overnight. It’s vital for you to work through the emotions that this betrayal has caused for you, and that means taking the necessary time to heal. After you’ve been betrayed, it’s a normal response for you to try to make everything right again. Chances are, you’ve thought long and hard about what happened between you and your husband, and what may have led to his betrayal. You know exactly what needs to change, and you think you know how to change it. This never works. You can never “fix” your spouse, and any attempt to fix him may even do more damage than good. Anger is a normal response once you learn about your spouse’s betrayal, and to some extent, expressing your anger is an important part of the healing process. However, dealing with your anger is so important and there are healthy ways for you to deal with it. When your anger gets out of control, it can actually sabotage your healing, and that’s definitely not something you want to have happen. At some point, it’s important for you to try to understand the circumstances that led to your husband’s betrayal. While this is certainly not something you should be expected to do right away, eventually, it will help you to know what causes him to sin sexually. Once you can work on this understanding, you’ll also find that you’re releasing your control over his behavior, and allowing him to be responsible for his own actions. Once a sexual betrayal has been committed in your marriage, attempting to heal on your own is almost impossible. There are so many emotions involved, and it’s difficult for you to make sense of everything that has happened. You need guidance, and it’s even better if that guidance is backed by the Word of God. Getting a professional to talk with you demonstrates your willingness to work through the sin that has occurred so that you can embrace healing and move forward in your marriage. Remember, your marriage and family legacy is your greatest asset. When you have been devastated by a sexual betrayal in marriage the main thing that is on your mind is to get out of the pain. The pathway out of your pain is to avoid the 5 major pitfalls above, while finding the right Christian coach or counselor who has the perfect step-by-step plan to move you out of your pain. 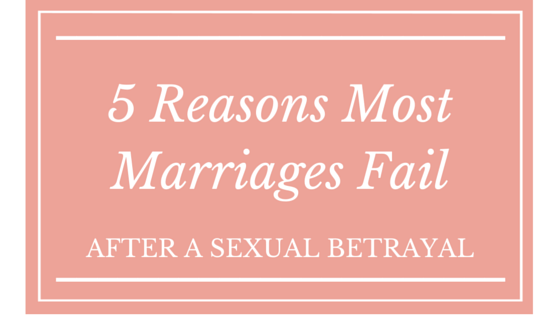 Has your marriage been suffering because of a sexual betrayal? Maybe you’ve even made some of these mistakes, but you’re not sure what else to do. A Christian Marriage Coach and Counselor can help you see things a different way, and shed God’s light on a situation that otherwise seems hopeless.